Chocolate Whoopie Pies made with brown butter and filled with Rosemary Orange Custard. A true taste of the Holidays and wonderfully warming and delicious! 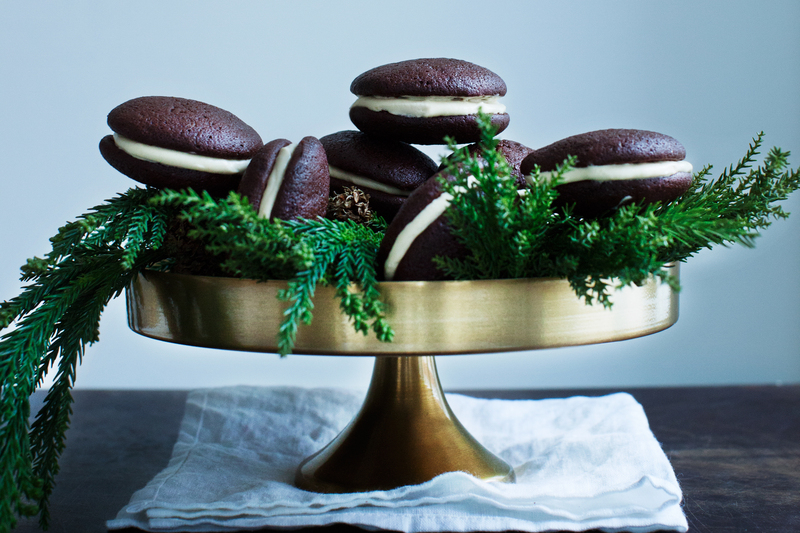 These Chocolate Whoopie Pies go perfectly with hot cup of cocoa or a glass of ice cold milk. 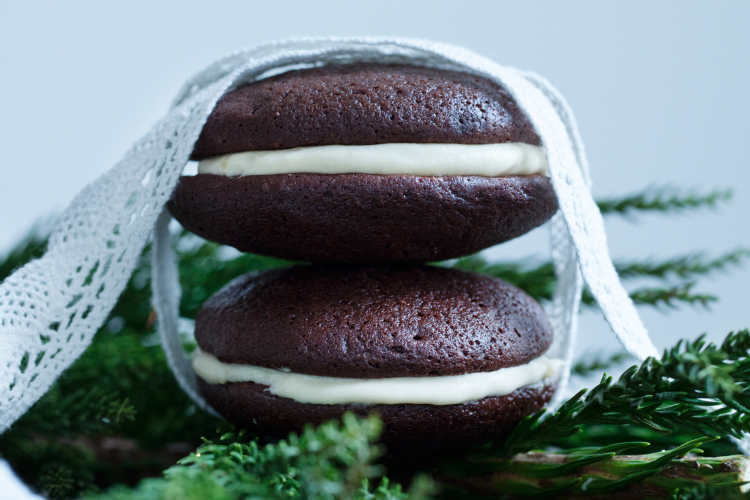 A Whoopie Pie is two halves of a small spongy cookies sandwiched together with frosting or custard in-between the layers. Fun Fact: The Whoopie Pies, also known as ‘Hucklebucks’ and ‘Creamy Turtles’ are Amish! Amish women would use cake batter leftovers to bake these tasty miniature cake sandwiches and then slip them into the farmers’ lunch boxes. When the farmers found the treats in their lunch, they would shout “Whoopie” and therefore the name ‘Whoopie Pie’. 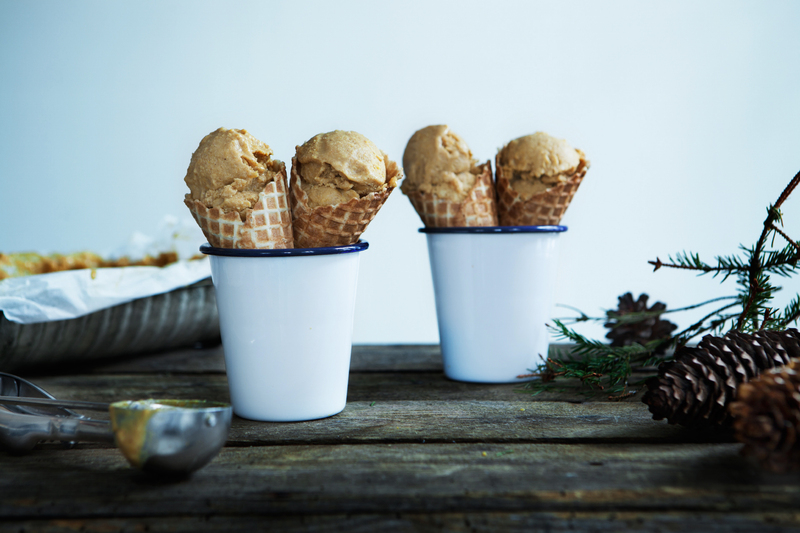 What is brown butter or Beurre Noisette? Unsalted butter is melted over low heat and allowed to separate into butterfat and milk solids. The milk solids naturally sink to the bottom of the pan and, if left over gentle heat, will begin to brown. As the milk solids reach a toasty hazelnut color, the pan is removed from the heat. Beurre noisette may be used in its liquid state, or cooled to a solid form. It has a nutty flavour and is particularly included in the batters for french pastry. As you all know I am a big fan of edible presents, and my Chocolate Whoopie Pies are totally in that category. Wrap them up with a ribbon, place them in a tin box or wrap them individually as small presents for your co-workers. Happy December everyone! Melt the butter in a saucepan and keep it over medium/low heat until it starts to brown and smell nutty. Be careful not to burn it. If you like me are in love with these Chocolate Whoopie Pies with a Holiday twist, you will definitely LOVE my Pumpkin Whoopie Pies!